Invisalign for teens and was introduced by Align Technology in July 2008. 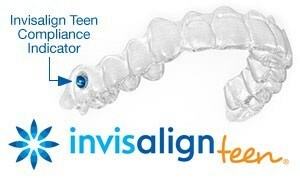 Invisalign Teen has all the features of the Invisalign full adult treatment, plus some really cool additional features that address the uniqueness of the issues we find with non-adult patients, such as compliance. Teens tend to forget to place their aligners back on after meal times, so Align Technology has designed “wear indicators” in the Invisalign Teen system that will gradually change the blue indicator to a clear colour as the aligners are being worn. This way we can see if they have worn their aligner for as long as they need to, which is 20 to 22 hours per day. Another great feature that Align Technology do for the Invisalign Teen, knowing that teens also tend to lose their aligners, they include six free replacement aligners, for those times when the teens accidentally throw the aligners away because instead of placing them in the aligner boxes provided, they wrap them in tissues, and you know what mom’s do…throw away tissues. The lack of self-confidence and the emotional issues caused by misaligned or overcrowded teeth don’t need to be amplified by attracting attention to this issue using metal braces. Just like adults, my teenage daughter preferred to have her teeth straightened “incognito” without attracting extra attention to her mouth during her treatment, and for her, no embarrassing moments in high school is a big deal. Brushing teeth for teenagers can be a challenge. Add metal braces to the challenge and we end up with an oral health disaster. Because the Invisalign clear braces are removable, maintaining good oral hygiene with normal brushing and flossing makes it so much easier to keep teeth and gums healthy. Invisalign aligners can be removed when needed, so sporting events and other school activities such as playing musical instruments don’t need to be compromised. With metal braces, teens need to refrain from eating certain foods such as popcorn, carrots or even apples. With Invisalign, there are no food restrictions. Invisalign aligners are much more comfortable to wear than metal braces, and there is no risk of lip and cheeks being cut from any brackets and wires. Q: What age can my teen start Invisalign? The front incisor teeth and the first molar teeth need to fully erupt. The teen needs to be compliant and mature enough to wear the aligners daily for 20 to 22 hours. Q: Will the payment for Invisalign for teens be covered by my dental insurance? A: Yes, if your insurance will cover for orthodontic treatment. It is important to check your coverage plan as each insurance company covers different amounts based on the level of the plan and how long you have been under that cover. At our dental clinic, we will help you gain all the insight you need regarding the costs and coverage of Invisalign for teens, so you can make an informed choice. Q: What happens if an aligner gets lost? A: You will need to call us immediately so that we can replace the aligner as soon as possible. With Invisalign Teen, Align Technology offers six FREE replacement aligners, so you will not be charged for the replacements. A: Many dentistry clinics and Invisalign-trained orthodontists can tell you that the treatment is completely safe as well as highly effective. There are more than 4 million documented cases of patients who were successfully treated with this method worldwide, and the aligners were cleared by the FDA as Class II medical devices. Q: What happens when I’ve finished my Invisalign treatment? A: At the end of your Invisalign treatment you will need to wear retainers in order to keep your teeth straight. There is a tendency for teeth to want to relapse back to where they were before straightening, and for that reason, we recommend retention for life. There are different types of retainers and to find out more about the different types of retainers and how to use them read our blog All you need to know about retainers For more Invisalign benefits and Invisalign FAQ’s visit our Invisalign page and our Invisalign Adults page. Q: What happens once the treatment is complete? A: We normally recommend a retainer to prevent the teeth from shifting back to their original position. Every case is different, however, and we will need to monitor your teen’s progress to know for certain which course of action to take.